Up to Some'ink! : Many cards, many challenges! As you can tell, I have been on a crafty spree and have been spending many glorious hours in my crafty lair lately. A) Because I am on holidays and b) because the little one started daycare yesterday! Also, the cleaner has just been, and I have the fridge stocked up with lunches and dinners for a few days so… Craft time! 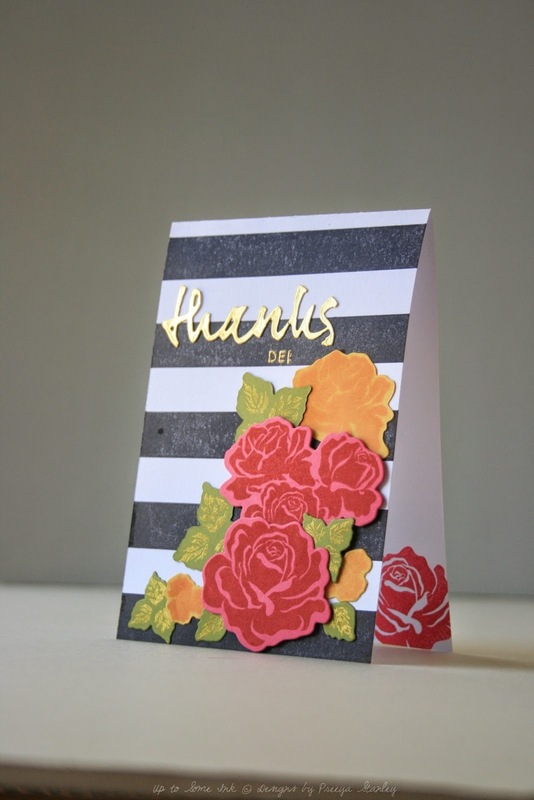 This first card is a special request by my darling Mum who wanted me to make a thank-you card for a someone called Dei. So I made this bright number that has been personalised to include her name in the greeting. This card is so bright and colourful. It makes me very happy. The next card is something I have had in my head for weeks waiting and waiting for my Lil' Inker's shipment to arrive. I lie. I ordered it on Jan 7, and it arrived in Sydney Australia on the 14th… Just ONE week.Which is pretty much magic. Must be sorcery or something cause that is so super fast! Not complaining! Anyway, I have been eyeing this set for weeks, and dreaming up things I could do with it. Of course the first thing to do is add a rainbow. So thats wht I did. With my Kuretake Gansai Tambi watercolours. This was so easy to do, and looks so great. I am gonna make a whole bunch of these. YA. I know. Stunning right. 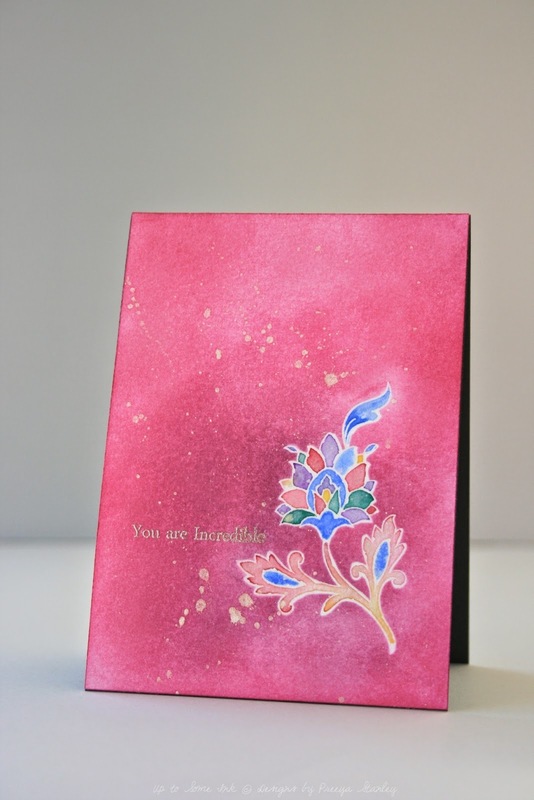 And so, I wanted to use my new Altenew and watercolour the heat embossed image using all those pretty colours in the jewels. I then masked the image and inked over the whole panel. I also splattered some perfect pearls over the front panel for shine and heat embossed the sentiment. Are you still with me? Thanks for hanging around for this very long post! You are on a roll girl. Love all three cards. But my fav is 1st one. Those flowers looks just gorgeous against black & that golden diecut...superb. All of the cards are gorgeous, Preeya! But the one layer card is truly a GEM!! Congrats on the Virginia's View Facebook feature! So happy to see you play! Okay, first of all, what a pleasure to meet you, Preeya! Your profile photo is breathtakingly beautiful!! Is it that sweet baby that just started daycare??? Your works of art are all spectacular!! Truly, what a joy to see your talent. I can't even pick a favorite as all three rocked my world. 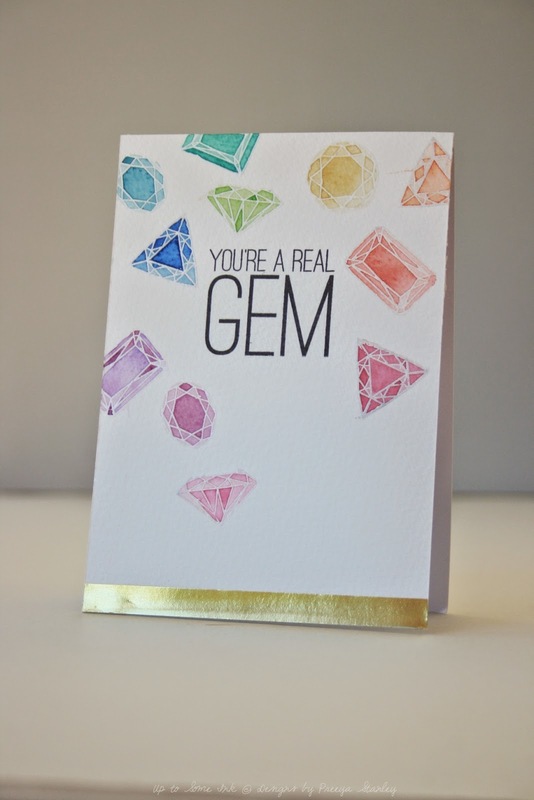 Thank you so much for entering that wonderfully CAS and beautifully watercolored gem card in the joint CASology challenge and my NBUS Challenge #3!! HI Darnell, thank you so much for that sweet and heartfelt introduction. Thank you for your kind comments. Yes, that tiny little baby started daycare! Time really does fly! I have followed you on Bloglovin! I would love to be introduced in your new friends corner! Thanks a bunch! Wow, three amazingly gorgeous cards! I adore that gem card for CASology...your coloring is fantastic! And the third card? A winner for sure! Thanks for joining us at CASology this week! A trio of stunners here, Preeya! I really love them all but those gems are especially dazzling! Thanks for playing along with CASology this week!